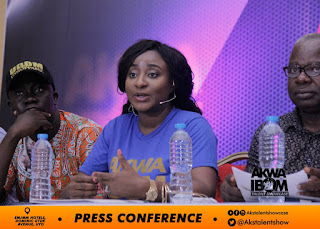 Nigerian Actress Ini-Edo Is Addressing The People Of Akwa Ibom State At Emjmm Hotel Akwa Ibom Talent Show. An address by Ini Edo, special assistant to Governor Emmanuel on Culture And Tourism, on the occasion of unveiling Akwa Ibom Talent Showcase as a pep to the growth of the Governor Udom Emmanuel led Government, 16th October 2018.
" I warmly welcome everyone present here in this press briefing, one that will define and bring new and aspirational meaning to the lives of young creatives in Akwa Ibom State. With great sense of humility as one who has grown to treasure the gifts of our creative industry, I welcome you to the beginning of this epic event called AKWA IBOM TALENT SHOWCASE and the crowning jewel of it all the 'NIGHT OF STARS'.